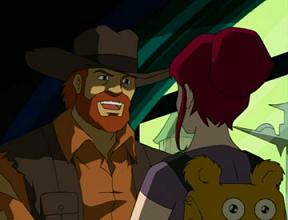 Augustus “Augie” O’Neil is April O’Neil’s uncle in the 2003 series. He first appeared in the episode April’s Artifact, where April tells the turtles that her uncle loves to travel, but then mysteriously disappeared. April had no clue where her uncle had gone. But then April and the Turtles get teleported to a weird dimension where Giant Wasps live via a strange artifact that had belonged August. April and the Turtles discover that August was teleported to the same dimension after finding his journal, having accidentally activating an artifact he was looking at. April and the Turtles got out of the dimension, but no sign of August. Apparently, the wasp queen interrupted him when he was attempting to dial Earth and instead went to another dimension. In the episode The Trouble with Augie, April gets a visit by her sister, Robyn. When Robyn’s checking her e-mail, she gets a strange message in strange signs. April calls Donny, who translates the message and discovers it´s from Augie! Determined to save Augie and with the same artifact from the episode “April’s Artifact,” April and Donny are teleported to another world where giant lizards live. At first, the lizards look like peaceful creatures and tell about a magician, who turns out to be Augie! Augie tells he helps the giant lizards to make a Transport Machine so the lizard people can use their technology to bring peace to other worlds, especially Earth. Don decides to take a look at the technology and explores the dimension, but only to discover that the giant lizards are using Augie to get to Earth to eat everyone! Donny warns April and Augie and the three flee just as the lizards decide to drop the charade. They escape into the Forbidden Zone, where massive piles of bones lay. Don access the city’s archive and learn that the lizards aren’t native to this dimension; they came in from another one and conquered the Zodac, the true inhabitants. Afterward, the lizards capture Augie and force him to complete work on the device and shield it from magnetics, which the Zodacs used to disable their device. Luckily, April come with the idea to use the Transport Machine to go to another dimension instead of the Earth, the Wasp World. But the lizard men are following right behind them, thinking they’re going to Earth. Arrived there, April and Don use magnetic charges to destroy the Transport of the Wasp World after they’re teleported back to Earth. When Augie, April and Don are back, the lizard men arrive and the magnetic charges destroy the Transport. The lizard men are now trapped in the Wasp World. Back on Earth, August is finally reunited with his family.